The major US indexes are starting the week with a yawn; spot implied vol has perked up a bit, but nothing too noteworthy. CME Group posted a strong piece on Fed policy and volatility. HV10 has just melted away, and now the real danger to vol longs may be a steepening state of contango. 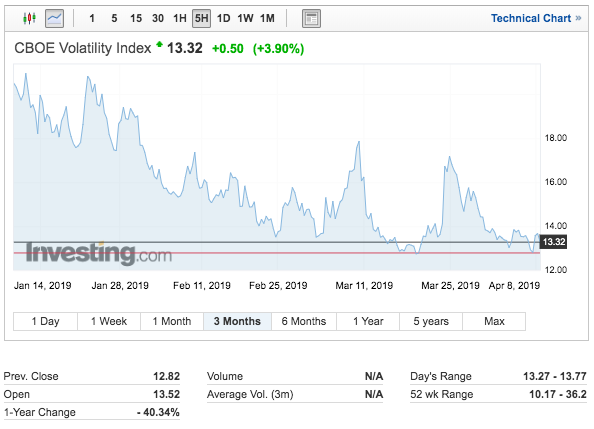 I'd like to highlight the work done by the CME Group, with a recent article entitled "How Much Does the Fed Influence Equity Volatility?" I am including a visual of the article summary here for your benefit. The article submits that, while it may be chalked up to a played out Wall Street maxim, the Fed does appear to have "magical powers" over equities. CME reminds us that in Q4 '18, the S&P fell approximately 20%. At the time, the Fed was signaling three rate hikes for 2019. Since then, the monetary body has altered its language so as to indicate no rate hikes for the remainder of the year; the markets have soared and various measures of volatility have been sent home in a body bag (spot VIX maxed at around 36... this past Friday it touched in the 12 handle). The piece goes on to claim that vol frequently spikes just as rate cuts are on the way, as such reductions in the Fed Funds rate tends to coincide with deteriorating fundamentals (our economy does look to be on shaky ground). Thank you, CME, for putting out a highly readable article on this important topic. ... and if you look below, atom & humber got out in front of that one! Thanks to readers for sharing their observations in the comments section (A&H actually had quite a few on that MVB: read here). Friday, March 22nd, SPX fell by almost 2%. As of this past Friday's close, the Mar22 data point fell off the HV10, showing the prior two weeks for what they really were: Deadsville. At the end of 2018, we saw HV10 (and 20) get very close to a 5 handle. That was just before October when things really started to cook in SPX and the volatility markets. Today's VX1 trades more than 7 vol points over the HV10 (about 4 points over the HV20). 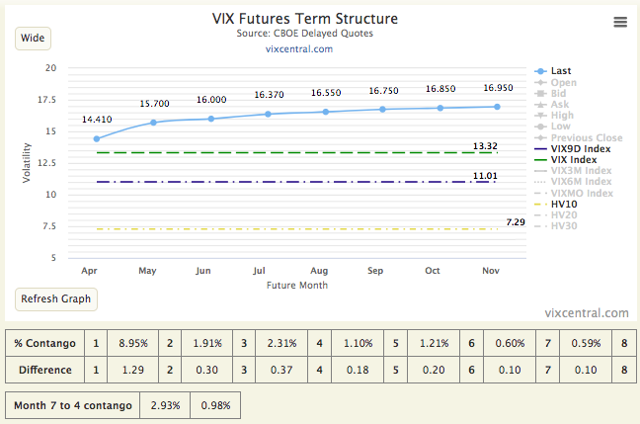 The term structure doesn't necessarily have to fall in any hurry, but a steeper contango sure looks to be in the cards. This eventuality would of course act as a detriment to love-vol positions (VXXB, UVXY). Even if the VX futures curve does meander lower, rips higher are always possible. This is why at present, I think the roll yield decay is more of a threat to long positions than the actual level of the term structure: even if you get in at too high of a vol reading, there is quite a decent chance that we'll get back there on a bump. The question comes down to how much decay you'll pay between now and whenever that jolt higher actually occurs. MVB reader "Inverted Noise" posted the above comment in the most recent article (published Friday). It is notoriously difficult to know whether political developments are improving or worsening, but the trade talks do look to be taking something of a turn for the better of late. Personally I think markets are likely looking for some concrete developments in the near future, or will lose their patience on having to wait things out. In any event, trade has certainly been the bogeyman of 2018-2019.